Wow. The last few months have been a whirlwind of activity both at home and in the office! Unfortunately it has been the Grass-trees blog that has suffered, but I guess my time has been taken over by plenty of modernist landscape projects so in a strange loopy way, it is this blog that carries part of the blame. As they say in the industry, it is good to be busy, so I am by no means complaining! So what has my life been like over the last couple of months? “Clearly too busy to write your blog!” you might say, and you would be right! But the world of social media has thrown out yet another way to share our lives and stalk others – Instagram. It’s a lot easier to take a photo of something that catches the eye, write some intelligent / witty / stupid comment and BAM it’s shared. So while I haven’t had time to write my blog, I have had time to Instagram stuff. It’s actually not a bad run-down of what I’ve been up to lately. As I said, work has really picked up, and that includes a few designs for mid-century homes around Melbourne and even a couple in Geelong. My wife and I still try to take any opportunity to get out for walks around our beautiful suburb (Beaumaris, VIC for those who came in late) so we load our little boy and dog up and wander the streets. There are plenty of amazing houses and gardens to look at, so I take the odd snap. We recently sold our amazing home and the lead up to that was a mad, stressful rush of tidying up the gardens and keeping the place presentable. A part of all landscape projects is the initial meeting with the client and discussion of brief, etc. It’s also a great chance to gawk at more amazing mid-century homes, such as this one in Frankston and this one in Beaumaris! One client in Templestowe Lower had this stunning 1970s plan for their ‘natural’ swimming pool. In this age of computer aided design, I am always in awe of such beautiful hand drawing. I recently completed the design for around the pool, so let’s see how it develops! September was Father’s Day and my little boy (and his Mum) bought me an amazing book on Julius Shulman and his photos of Palm Springs. Well worth a look, just don’t drool too much over the pages…. 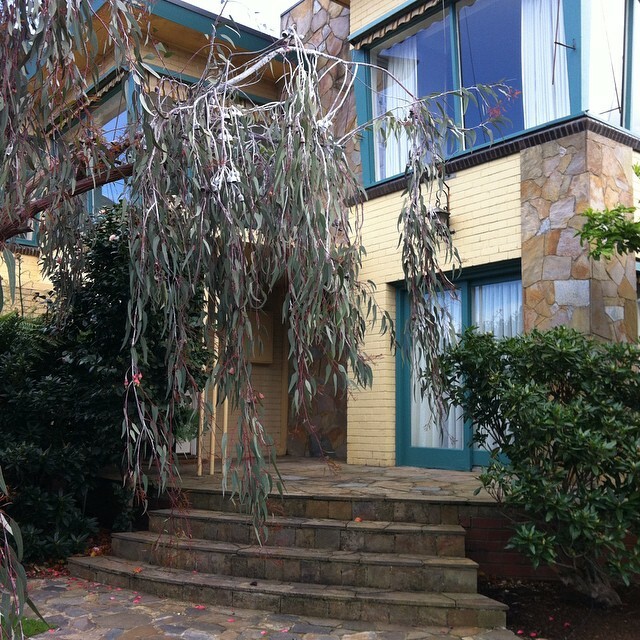 I had a meeting with the Robin Boyd Foundation at the iconic Boyd House II at Walsh Street, South Yarra. It was amazing to talk about the gardens and what the foundation is hoping to do there. I hadn’t been to the house during the day and it took my breath away! On the home front, my wife and I have tried to maintain a productive garden in amoungst the Australian natives and ornamental courtyards. A part of this has been our chickens, but sadly the last of our original adopted battery hens died a couple of weeks ago. Gladly, she lived longer with us than at the battery farm, so we are happy to have given her a better life. And lastly, the mid-century fraternity was in a flutter over the recent Mid-century Modern: Australian Furniture Design exhibition at the National Gallery of Victoria. It was pretty impressive and I just had to snap that iconic image of the Neil Clerehan living room (complete with Featherston chairs)! So there you have it. That’s been my life (as well as having an amazing time with my wife and little boy, who is growing up SO fast)! Please stay tuned for more Grass-trees and Butterfly Chairs, and in the meantime why not follow me on Instagram (@jasedavo)!